Definition at line 68 of file swapout.c. Definition at line 65 of file swapout.c. Definition at line 590 of file swapout.c. Definition at line 633 of file swapout.c. 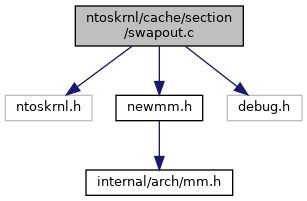 Referenced by CcShutdownSystem(), and MmInitSystem(). Definition at line 165 of file swapout.c. Definition at line 279 of file swapout.c. Definition at line 345 of file swapout.c. Referenced by MiCacheEvictPages(), and MmPageOutPhysicalAddress(). Definition at line 87 of file swapout.c. Definition at line 74 of file swapout.c. Referenced by MmInitSystem(), and MmpPageOutPhysicalAddress(). Definition at line 86 of file data.c. Definition at line 26 of file rmap.c. Referenced by MmDeleteAllRmaps(), MmDeleteRmap(), MmDeleteSectionAssociation(), MmGetSegmentRmap(), MmInitializeRmapList(), MmInsertRmap(), MmIsDirtyPageRmap(), MmPageOutPhysicalAddress(), MmpPageOutPhysicalAddress(), MmSetCleanAllRmaps(), and MmSetDirtyAllRmaps().